Editor’s Note: We’ve confirmed that all options — grab and go, the buffet, and the food truck options, are all considered to be quick service credits on the Disney Dining Plan. 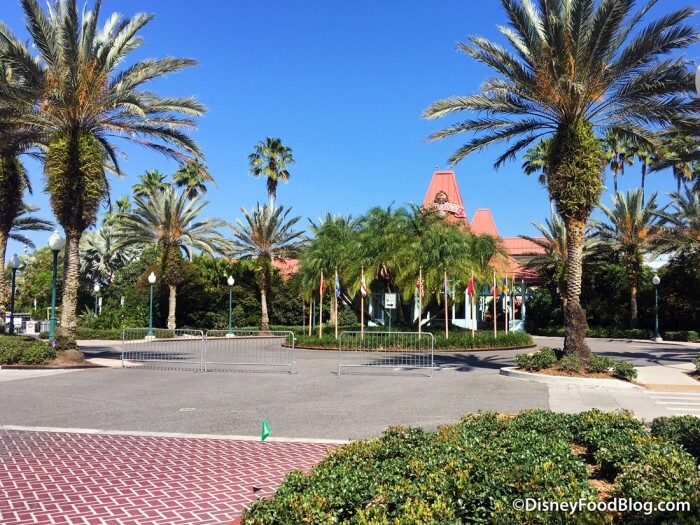 Thanks to the huge brouhaha that it caused, most of us know that Disney’s Caribbean Beach Resort at Walt Disney World is undergoing a massive renovation starting — well, now. 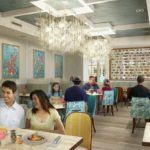 While the resort undergoes what is from all accounts going to be a gigantic, transformative makeover, dining options are obviously going to be impacted. 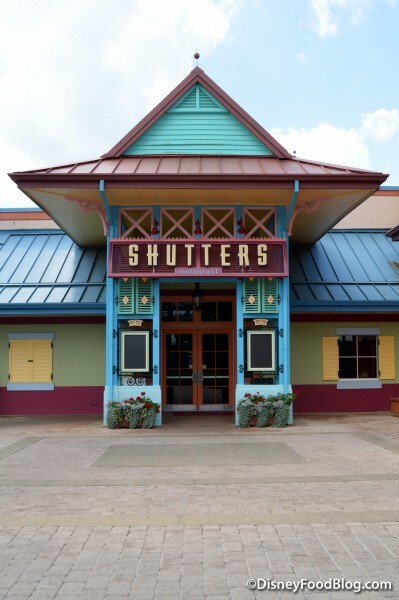 In fact, Caribbean Beach Resort’s only bar, Banana Cabana, and its only sit-down restaurant, Shutters, are closing to make way for the overhaul. 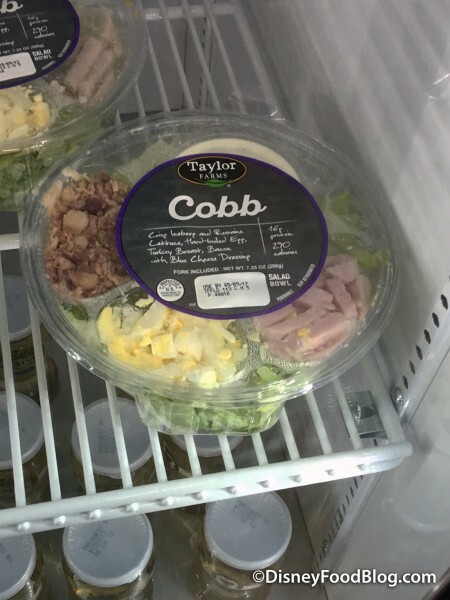 Obviously, people still need to eat, though. So we’ve been monitoring the situation closely. As part of that, we’ve visited the resort a couple of times over the last two weeks to bring you descriptions and photos of everything, as the transitional plans shape up. 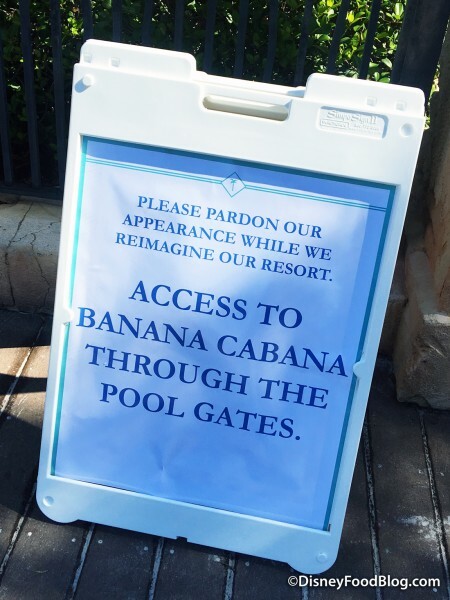 As of press time, Banana Cabana is still open, but will close in the near future. The updated buffet area is now open for breakfast and dinner. We’ll take a closer peak at the set up there in just a moment. 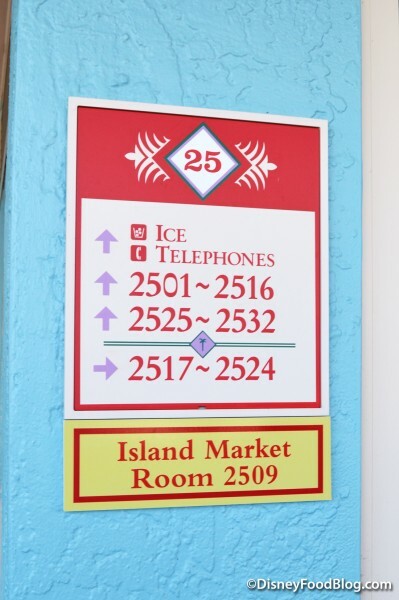 Let’s take a look at it all — what you can expect if you’re visiting or staying at Caribbean Beach Resort sometime in the foreseeable future. 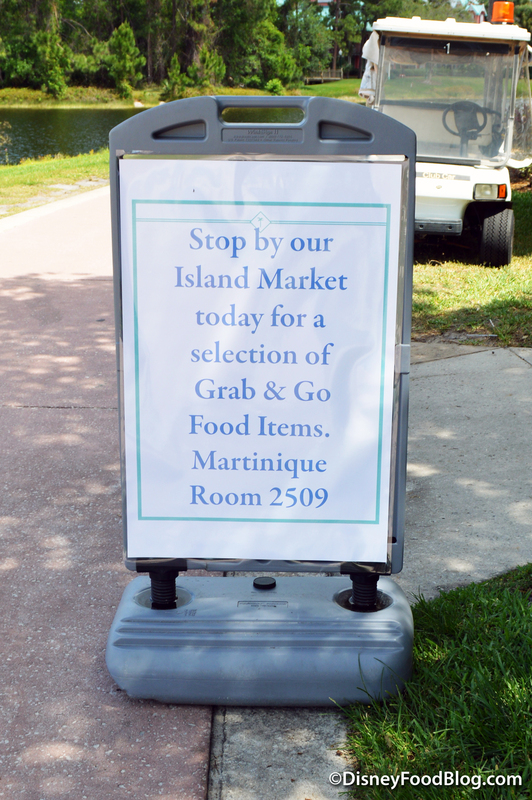 During our first visit last week, we were able to get a first look at the new Martinique Island Market. Yep. Your eyes do not deceive you. The Martinique Island Market is a repurposed hotel room. 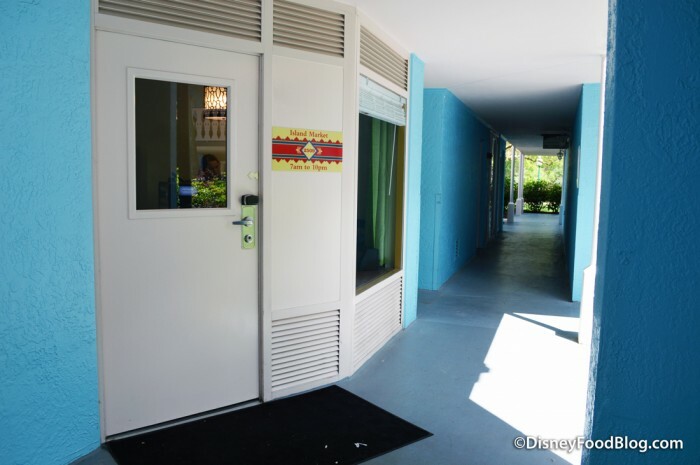 They’ve added a window in the door to make it look a little less…hotel room-y? 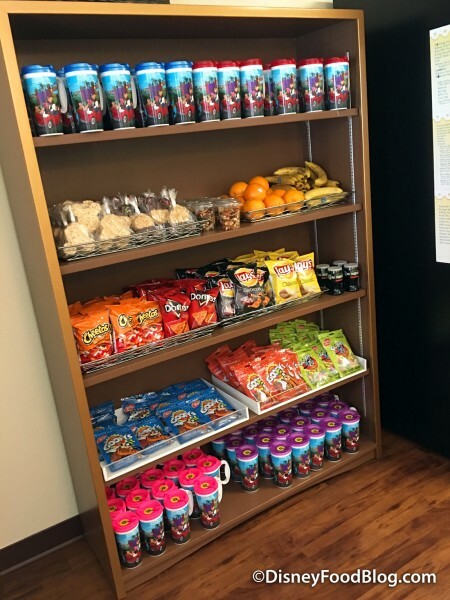 Inside, the set up is similar to many grab and go areas in other resorts. 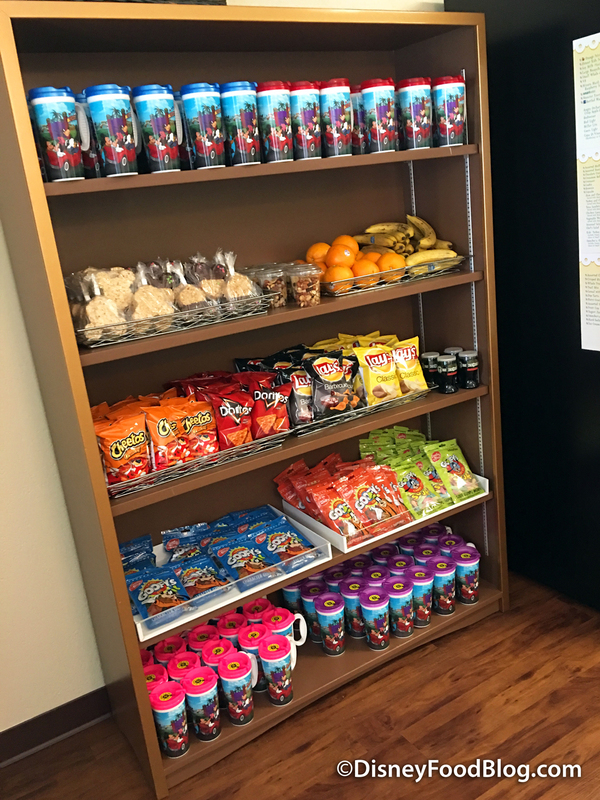 A bookcase held an assortment of refillable mugs, Mickey krispies, fresh fruit, and assorted chips. 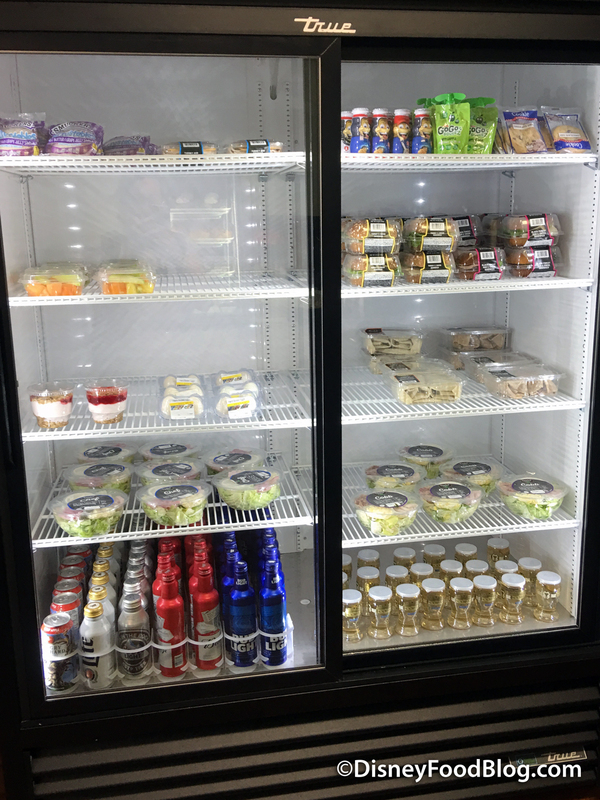 A cooler was stocked with additional items, including fresh fruit, Uncrustables, desserts, wine, beer, and more. There are some actual meals here. The day we visited, there were chicken Caesar wraps, Cobb salads, and pre-made sandwiches, all ready to go. 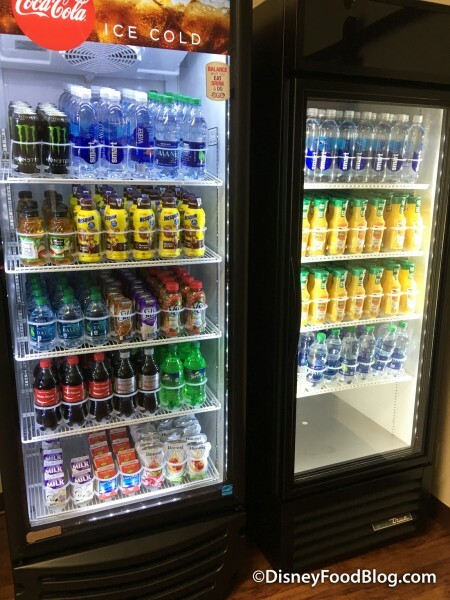 A separate cooler held additional bottled drinks, like water, juice, soda, and milk. There was also a microwave for warming purchases. 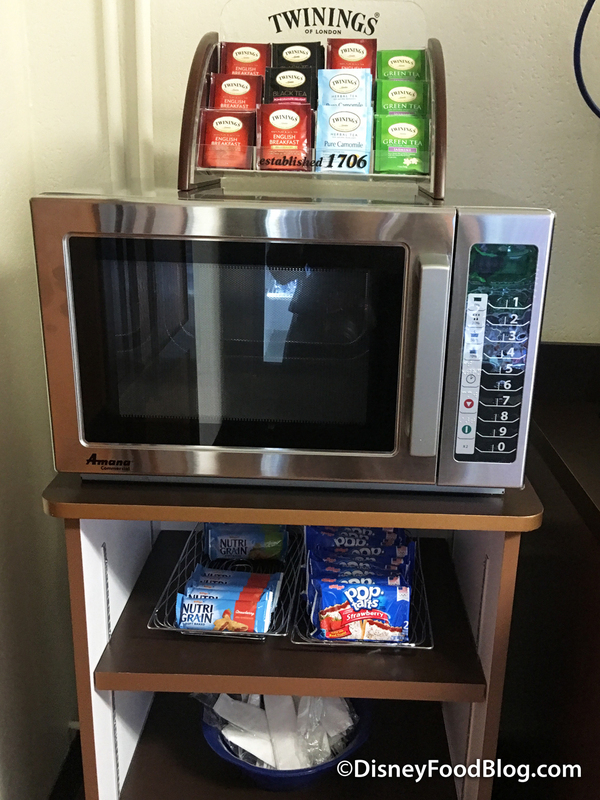 We found a selection of Twinings tea, Nutri Grain bars, and Pop Tarts as well. A coffee station dispenses java as well as hot water, and condiments are available for customizing your hot drink. 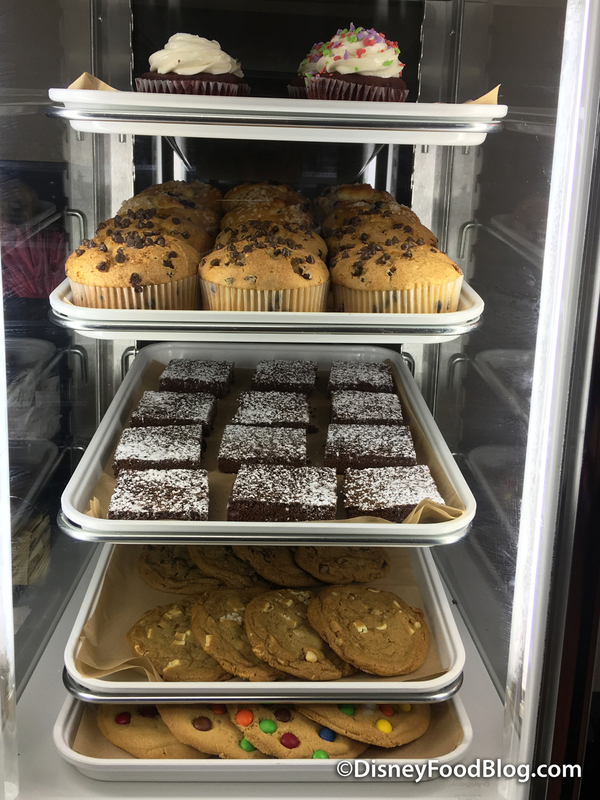 A tiny pastry case shares counter space with the coffee station, and offers up assorted bakery items like muffins, cupcakes, brownies, and cookies. 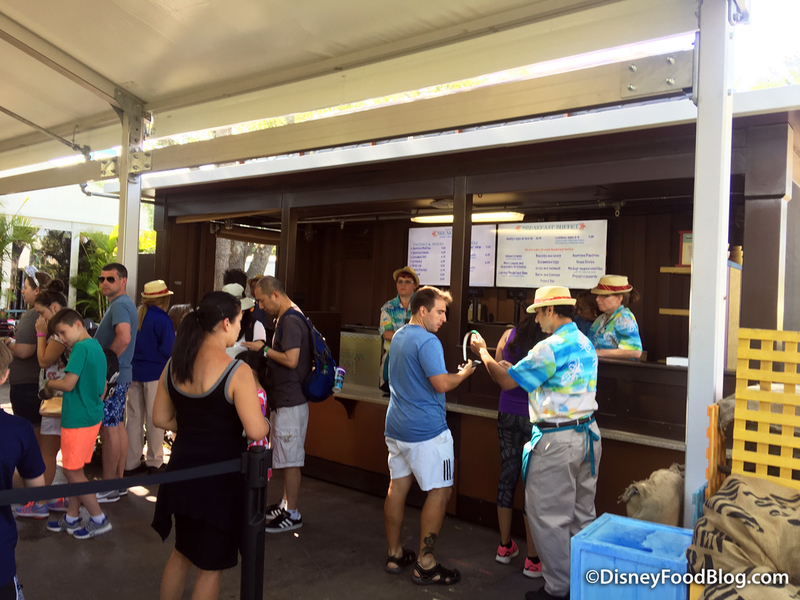 You might be wondering where the refillable mug station is, since it wasn’t in the makeshift Martinique Market. We were, too. 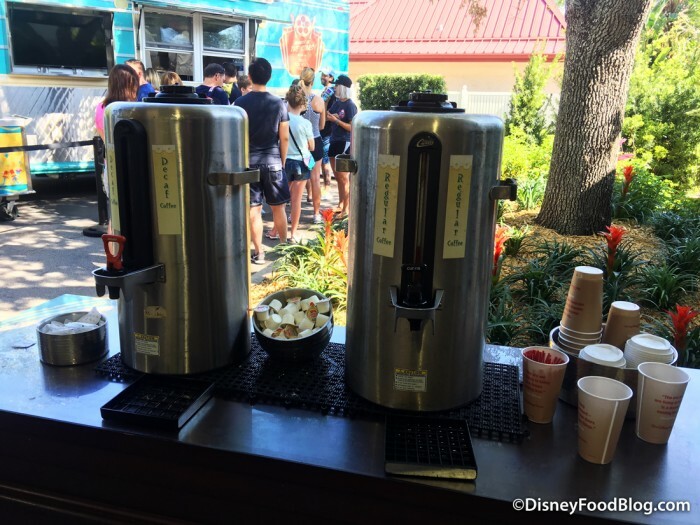 According to cast members that we talked to, refillable mug stations will be by the small rooms where ice is dispensed. They were scheduled to be available possibly as early as Friday, May 5, but we have not seen them yet. 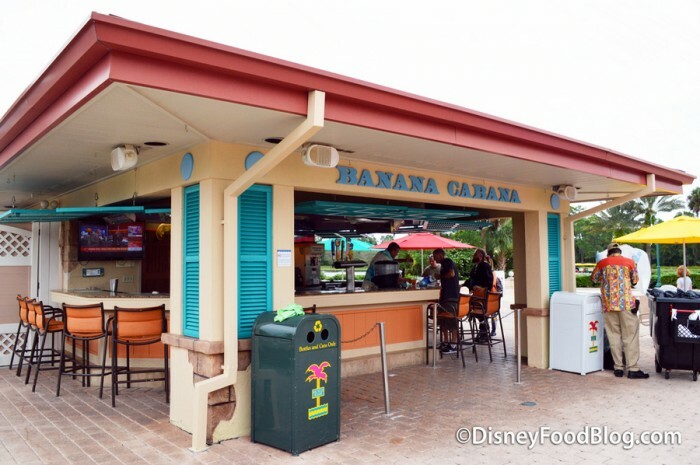 Because a bar is pretty much a requirement for a vacation for lots of us, we also asked if there would be a bar opened to replace Banana Cabana. 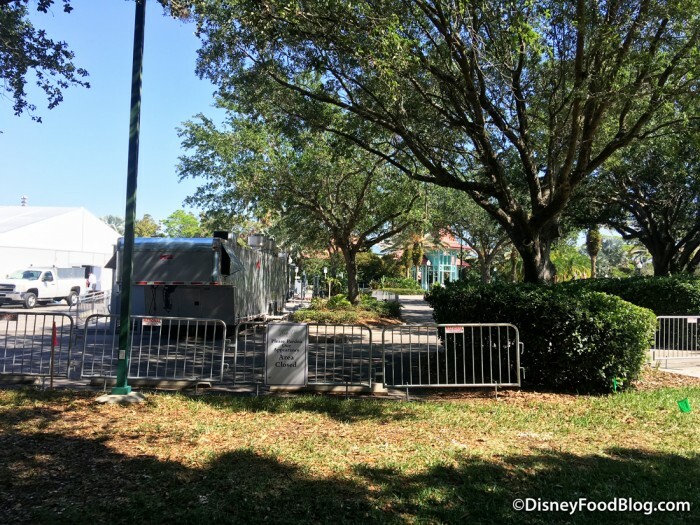 We were told that there will be a bar constructed in the Old Port Royale parking area. 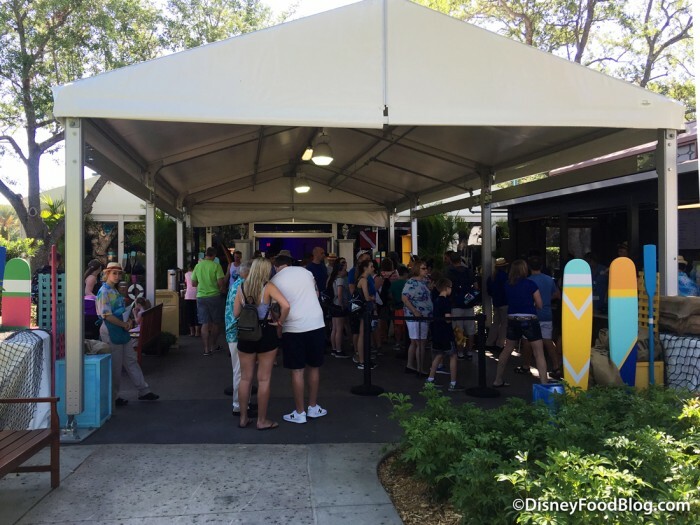 Think “pop up” bar, like you often see around Disney during special events or extra busy times. For now, though, guests can still access Banana Cabana through the pool gates. 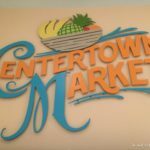 We were back again this week so that we could share with you the very latest updates to the area. Old Port Royale Centertown and its restaurant, Shutters, is now, well, shuttered. Even the circle leading up to the building is closed. 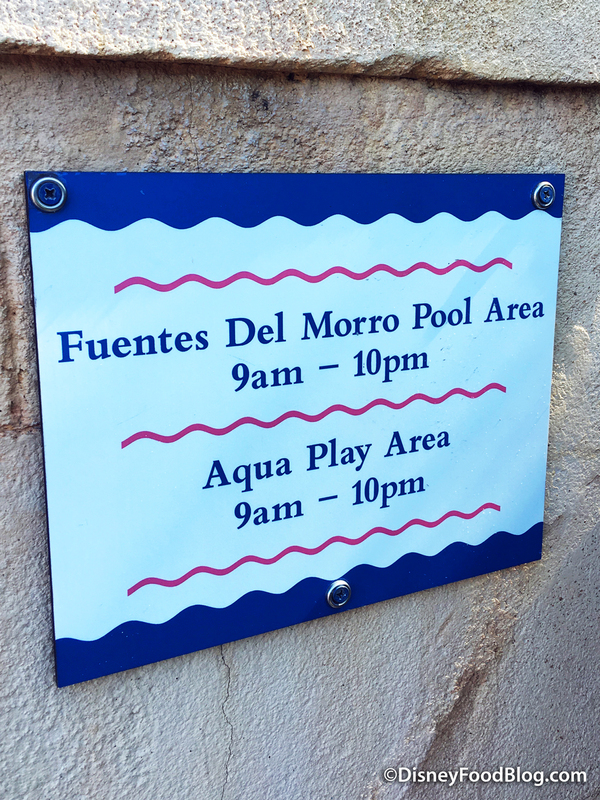 The new food area is set up by the Fuentes Del Morro Pool, which is the main pool for the resort with the fort and play area. It’s located directly behind Old Port Royale Centertown. 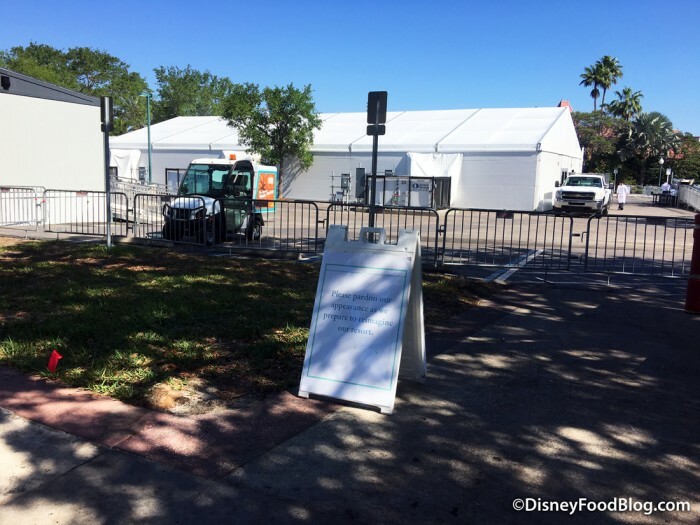 The makeshift dining area is comprised of a tent that houses a buffet as well as a Disney Food Truck for guests seeking a la carte options. Enter this covered area, and you’ll find ordering areas and cashiers on the right hand side. There, you can either pay for the buffet, or if you prefer, you can go to the left and place your food truck order. We snagged a copy of the buffet menus, complete with pricing, for you to see. The Superstar Catering Food Truck (usually parked in Disney Springs) was on duty the day we visited. 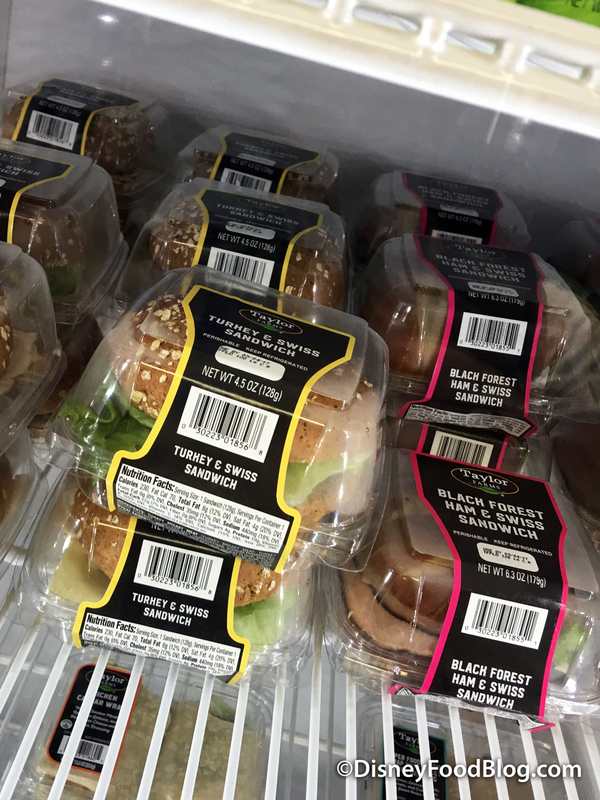 No word yet on whether the food truck options will change or expand. Food truck options include some hot grilled items for breakfast, lunch, and dinner. 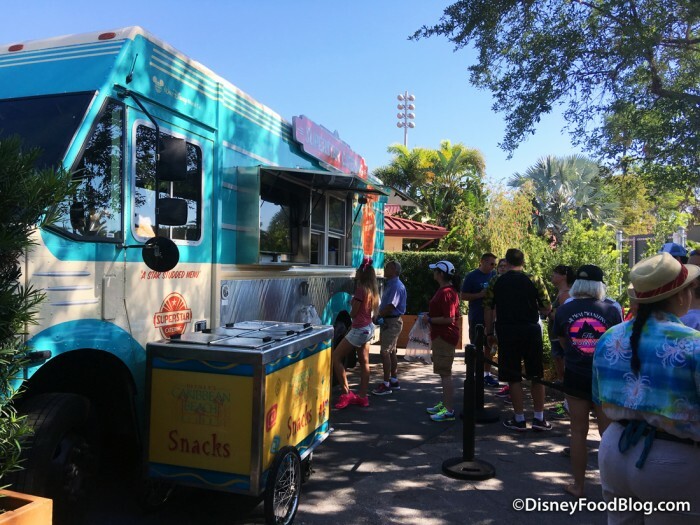 Note that food truck breakfast options are available 7:00-11:30AM, and lunch and dinner are available 11:30AM-9:00PM. 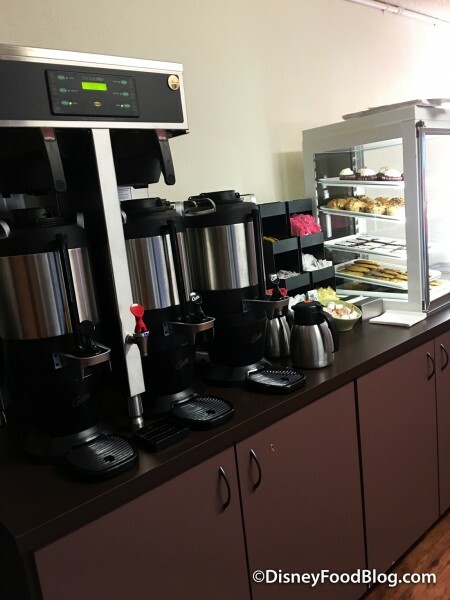 Randomly, there’s also a coffee station outside the tent as well. 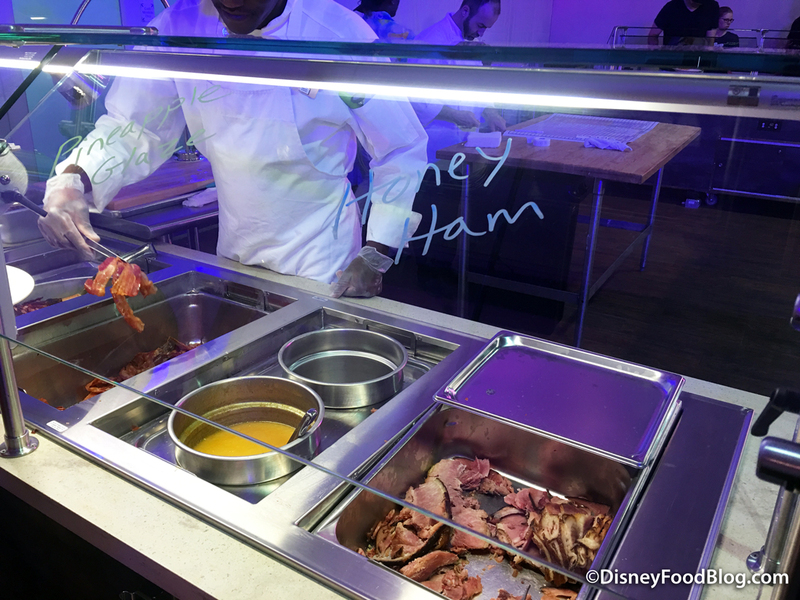 Once you pay for the buffet, you’ll be given a wristband, which gives you access to the actual buffet line. 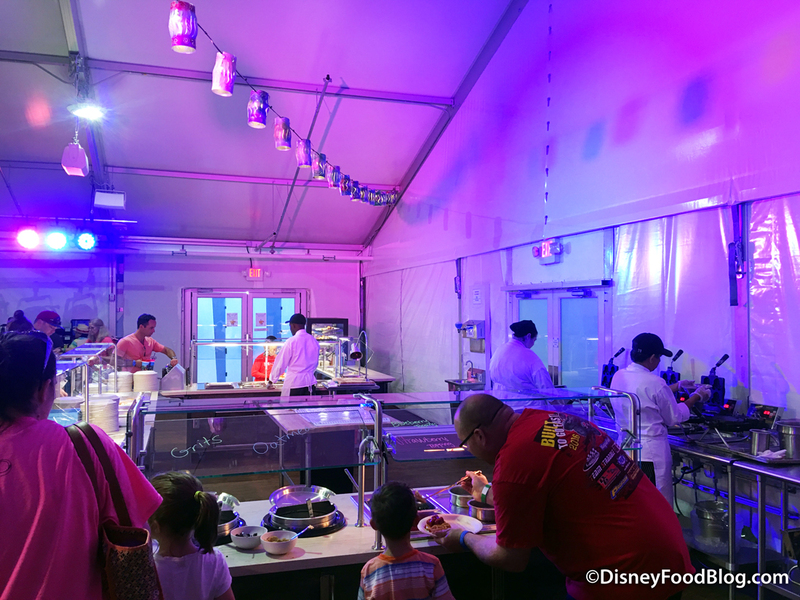 Both seating and the buffet itself are located inside the air-conditioned tent, and we were happy to see culinary staff preparing some food right there on the line. Items on the buffet are labeled directly on the glass so that you know what you’re getting. 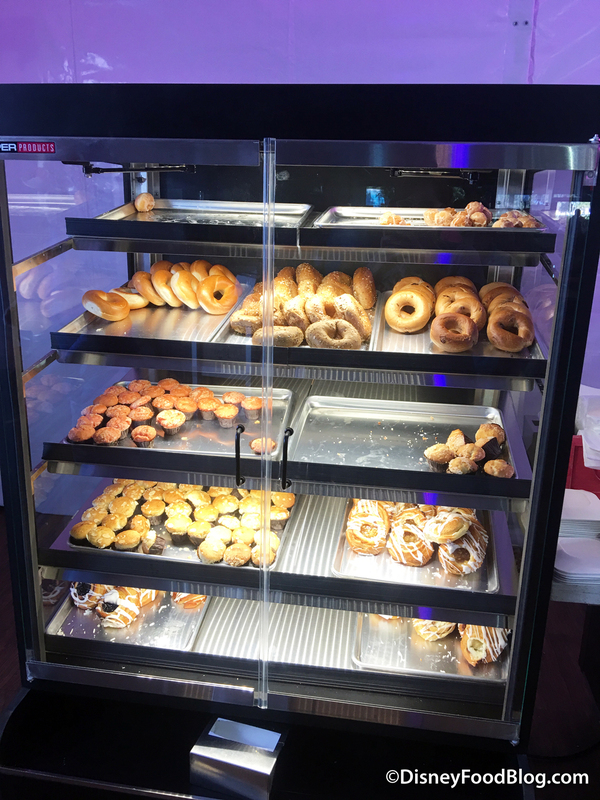 There was a selection of cut fruit, and containers of butter and cream cheese were available for toast and bagels. 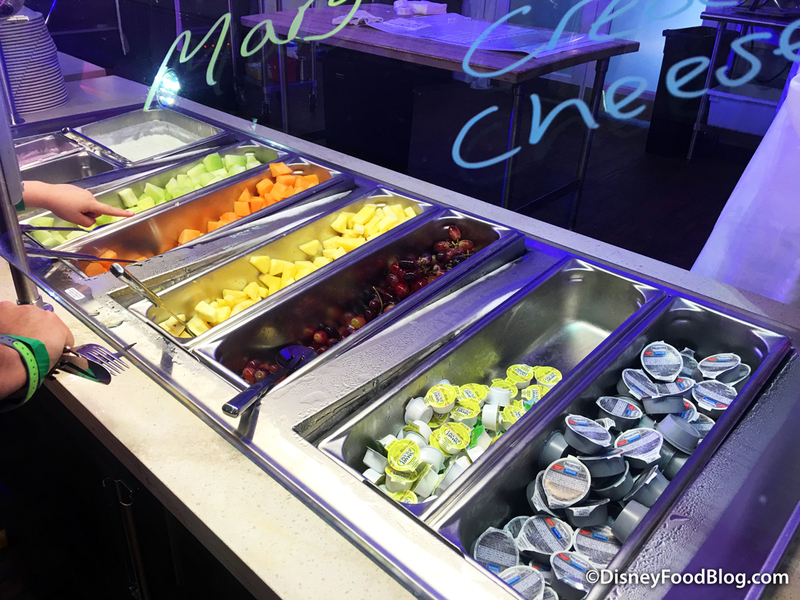 We found standard Disney breakfast buffet items the day we visited, including these guys! 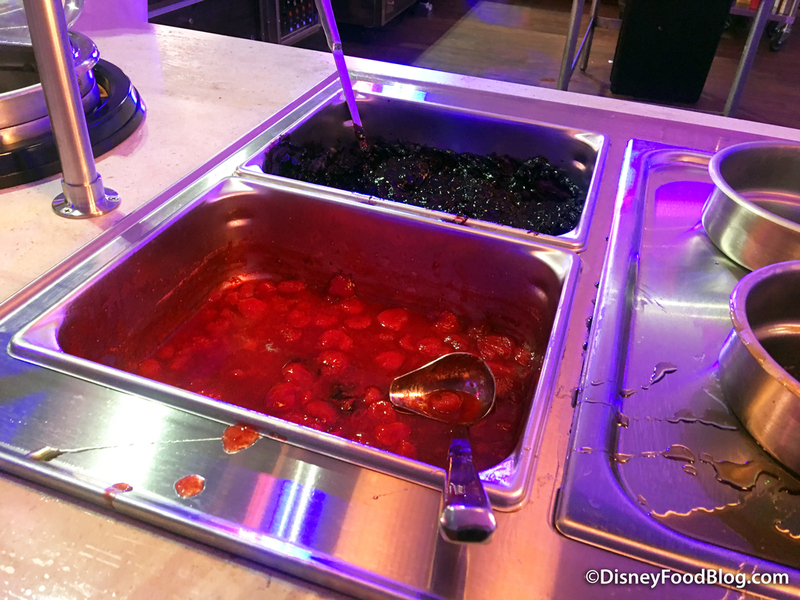 Toppings for the waffles included blueberry and strawberry compote as well as warm syrup. 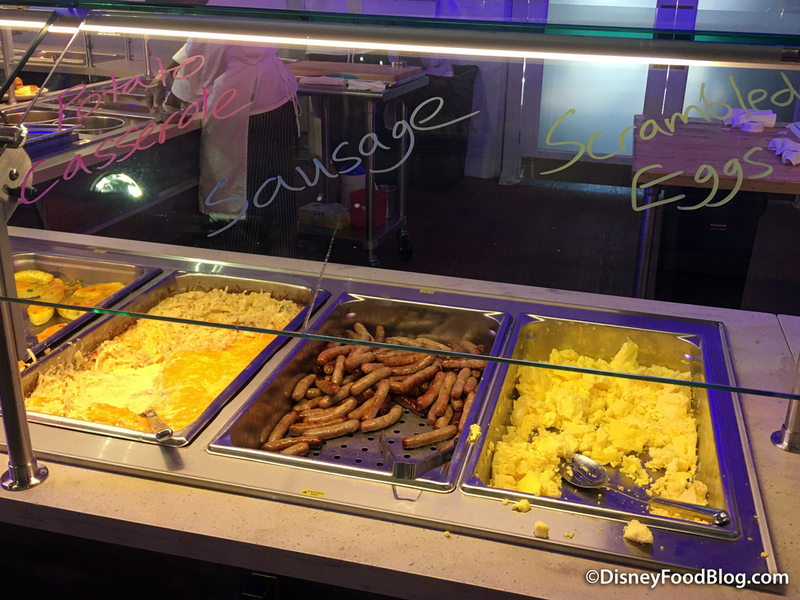 Savory hot items included potato casserole, link sausage, and scrambled eggs. There were also island crepes and individual veggie fritattas. 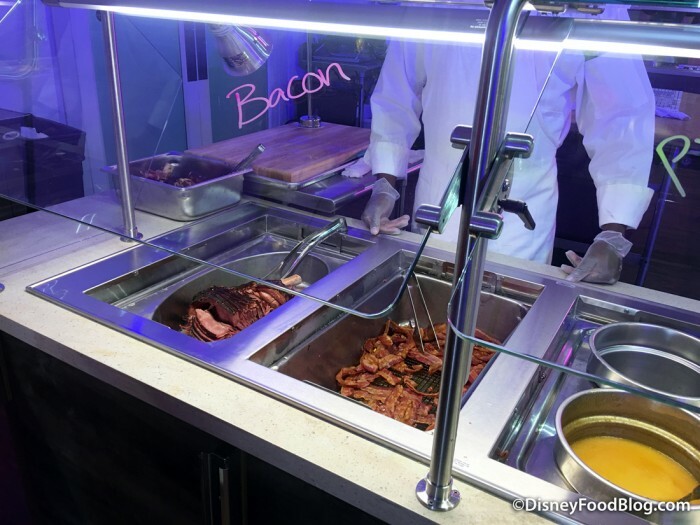 Of course, guests could also take advantage of all the bacon and ham they could eat. 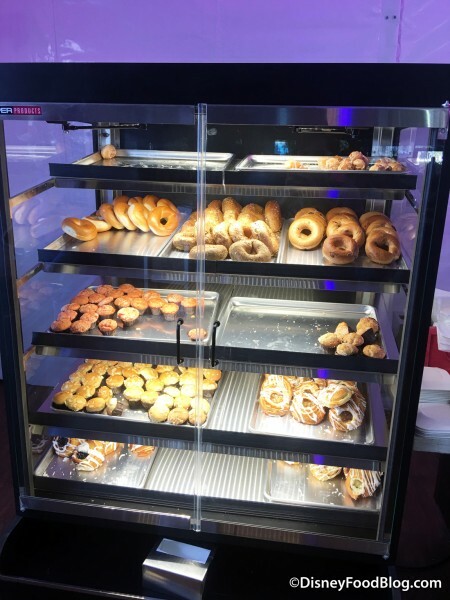 A separate section held breads and pastries, and included bagels, muffins, and danish. 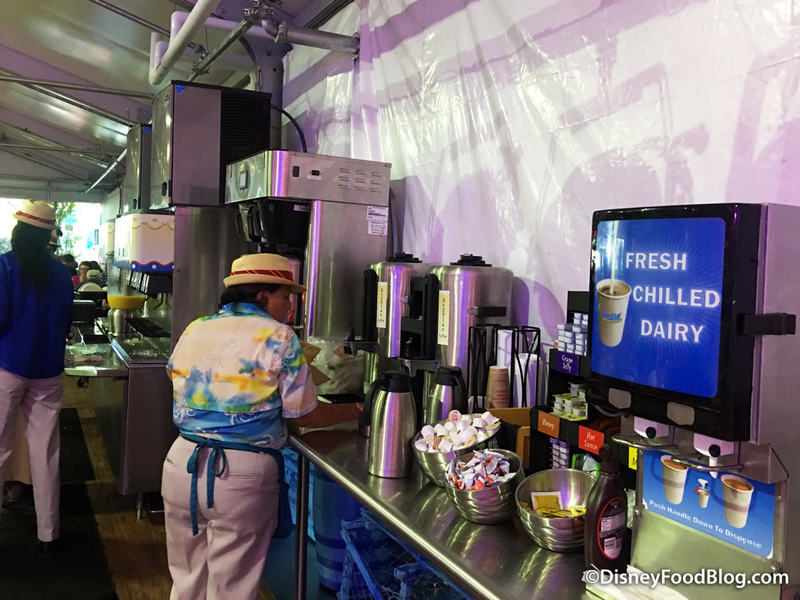 A beverage station was located to one side of the tent. 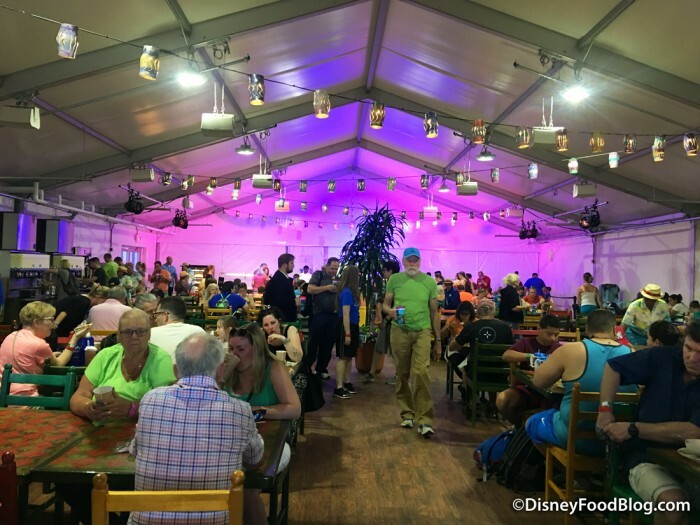 If you’ve visited Caribbean Beach Resort before, then the lanterns, tables, and chairs in the dining area will probably look familiar to you. 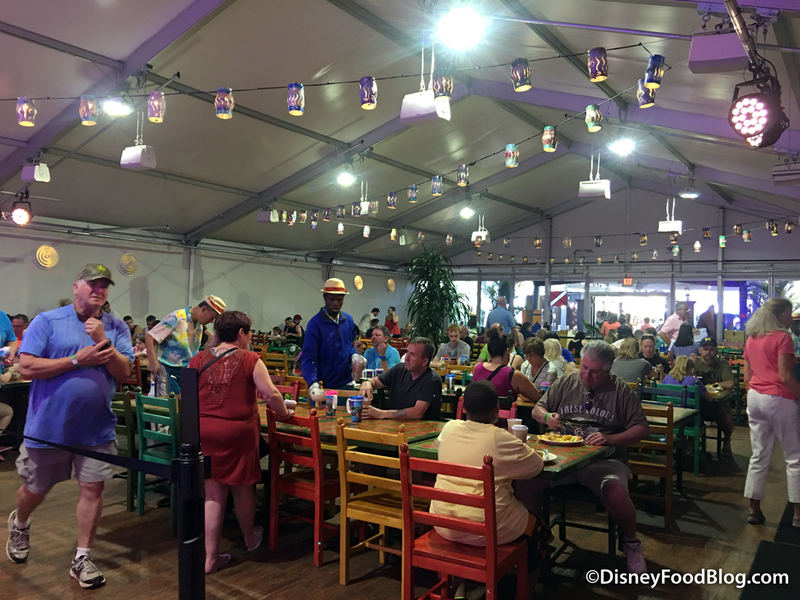 It’s important to note that you can use this seating area whether you’re dining from the buffet, or you’re purchasing your meal from the food truck. Well, that’s all we have so far! We know that these closures and changes impact quite a large number of you, so we’ll continue to monitor the situation and update you with news and photos as the story continues to develop! 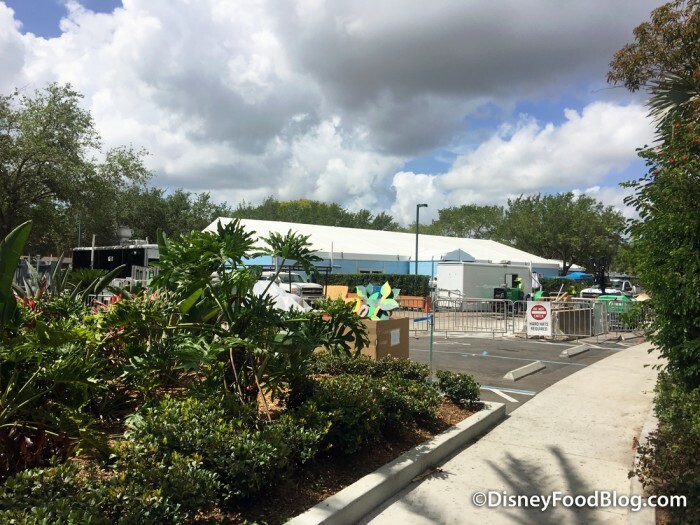 But for now, what do you think of the dining and drinking changes happening at Caribbean Beach Resort during this massive construction period? Leave a comment and let us know! News! 2018 Disney Dining Plan Updates — Now With Alcohol! 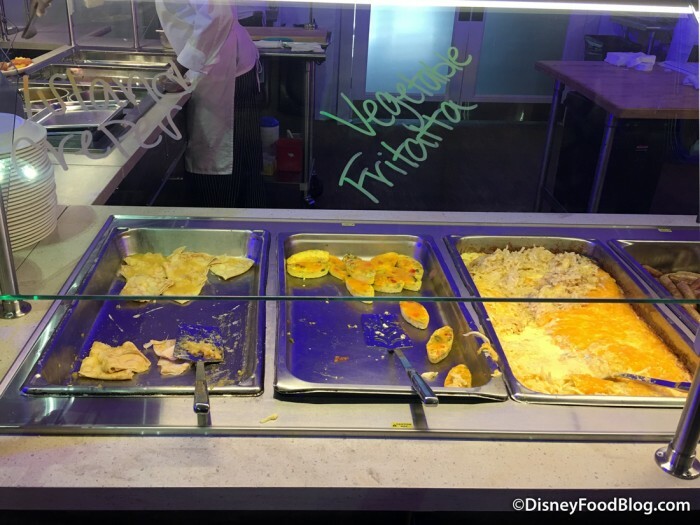 Disney World’s Caribbean Beach Resort Dining Update: New Sebastian’s Bistro and More! « News: Full Menu for Pongu Pongu, and DFB’s “Eat This, Not That” Video for Animal Kingdom’s Pandora! Quick question re: the gift cards. We have chosen CBR to stay at next may ’18. We we’re unable to book until now because 2018 packages were not available until this week. Will we still be given the gift cards? Tina — Not as far as we understand it. The gift cards were available to guests who booked their vacations prior to March 19, 2017, for arrival May 1, 2017-June 30, 2018. Brooke, no, the gift card offer was made to those who had a vacation already booked at CBR. Those who have booked since the announcement of the construction are now booking knowing that they vacation may be affected. I would advise another resort if you plan to spend time at the resort. Tricia — Thanks for your input! The text of my comment came directly from the emails that guests shared with us here at DFB. Regardless, anyone who booked after the March 19 will not receive the gift card. Hope this clarification helps! Melanie — Disney is extremely good about accommodating guests with allergies. 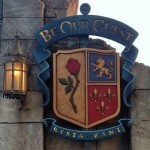 When you arrive at the restaurant, let the cast members know that about your son’s allergy, and they’ll guide you. You can even request to speak directly to a chef. Do you know when the renovations are due to be completed? It is my understanding from reading various articles on the net originally construction was to be completed late 2018. Now it appears it will not be completed untill early 2019. The construction mainly will be on the new high rise hotel which is planned I beleive where Barbados was torn down. Most everything else is to be completed. We are coming the end of October and right now are staying at French Quarter but considering switching here since my parents can’t get a room at FQ and it would be nice to be together. 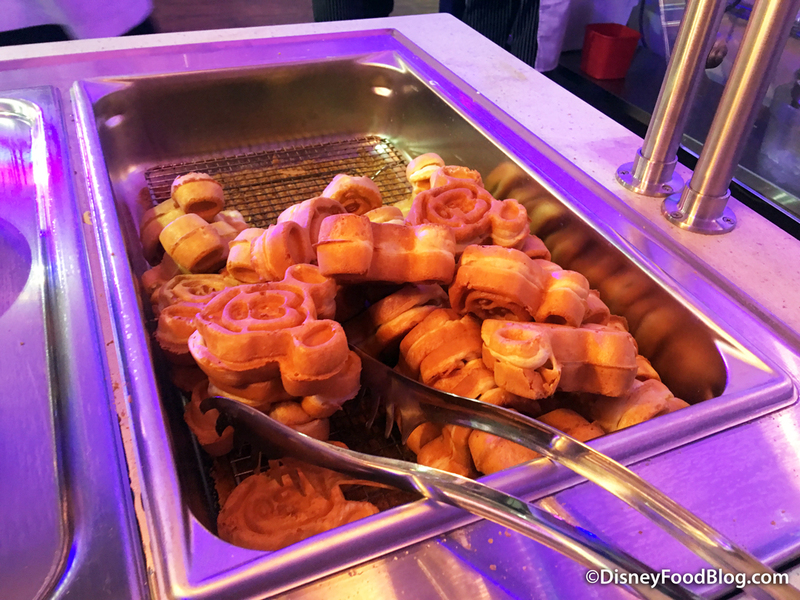 My question is with the breakfast buffet, my son who is 4 will literally eat a mickey waffle. I don’t want to pay $11 for just one waffle. Does anything stop me from just feeding him off my plate and not paying for him to eat? 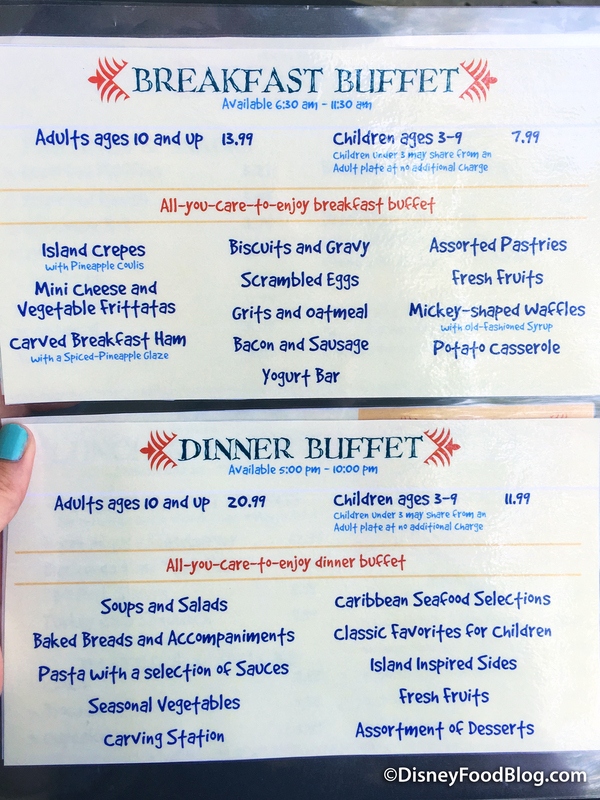 Allison — In normal buffet situations, you pay for anyone over the age of 3. Any child under the age of 3 is free, and can eat from your plate. 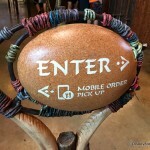 Check with staff as you check in. You may be able to do this, but I can’t say for sure. We are visiting Early April 2018. 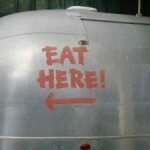 Does anybody know when the works on the food venues will be complete? We are trying to get an idea as to how much our holiday will be disrupted. 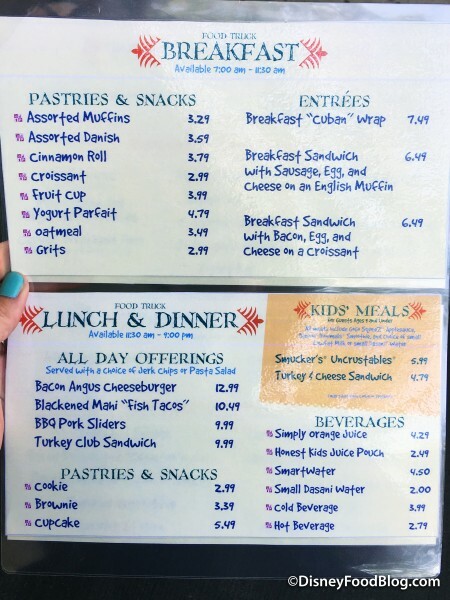 My husband, eldest son and I plan to eat from the breakfast and dinner buffets, but since our younger children (age 5 and 7) eat so little, I am planning on just buying them something from the food truck using the gift card we were promised after booking or snack credits. 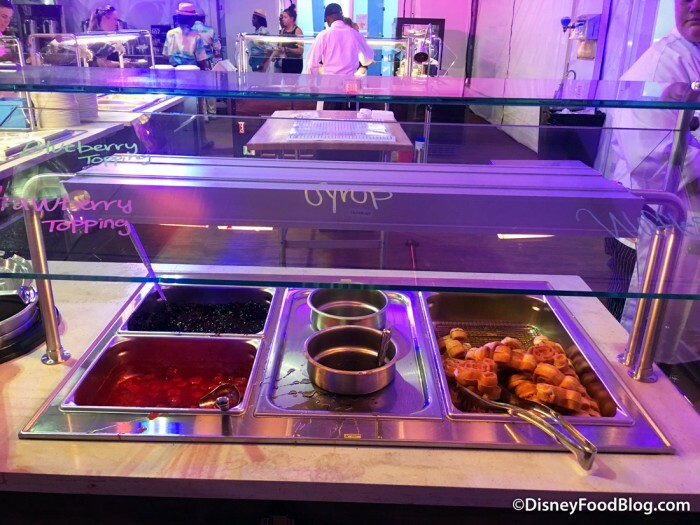 It’s a little annoying that the buffet and food truck have different hours… will we be able to bring our little kids through the line with us and into the seating area until the food truck opens in the morning? Hello! I have a question and was hoping someone from DFB could answer! I’m going to be staying at this resort hotel in April and wanted to know what kind of gluten-free and dairy-free options are available at the buffet and food trucks. 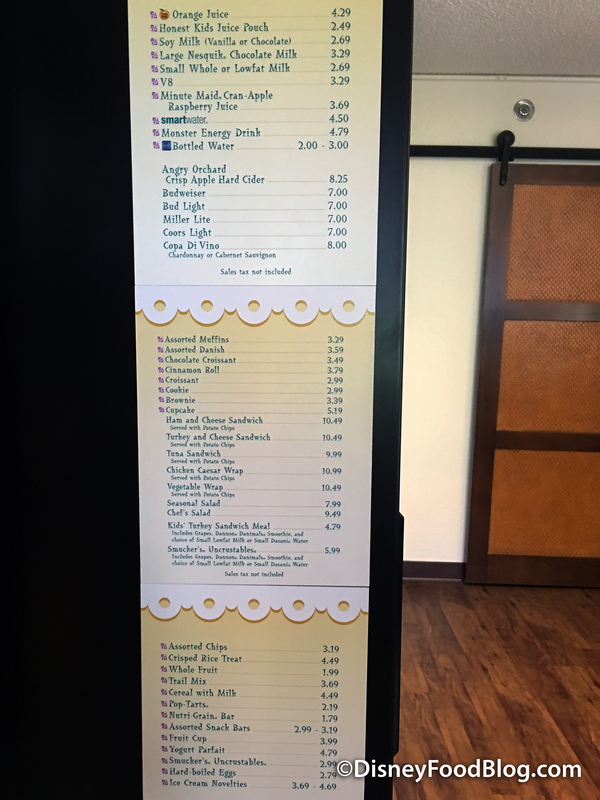 Back in 2015 we stayed at Coronado Springs and every morning I was able to get GF mickey waffles, french toast, pastries, etc. I was wondering if the option would be available even during refurbishment here. 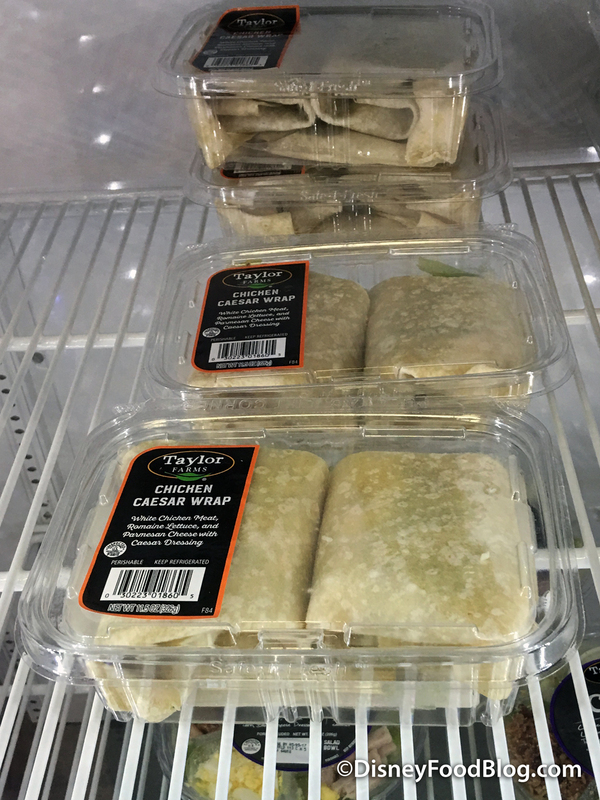 I’m still working on planning out my meals! Thank you!! 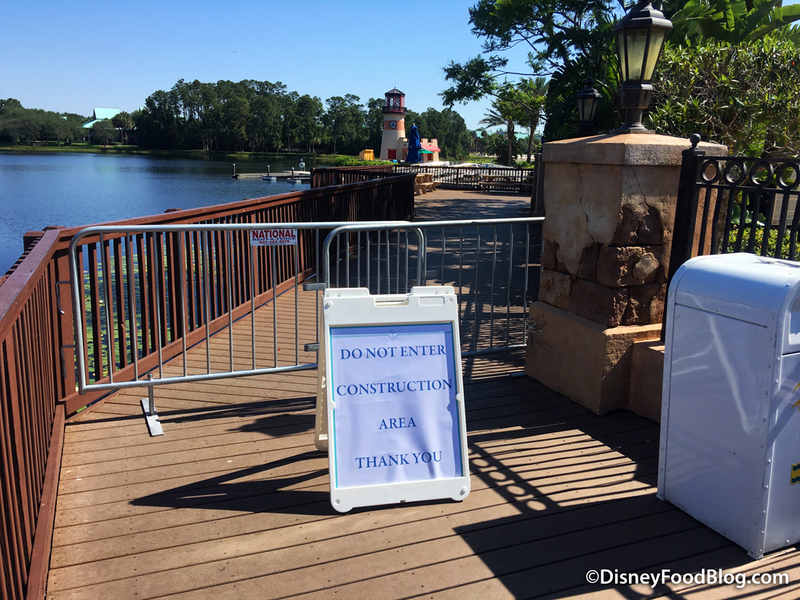 Ann, back in spring 2017 when Disney announced the construction dates for the resort, they offered gift cards to guests who booked by a certain date or visited by a certain date. But that offer ended sometime last year. When was this review written? Is it still accurate?